Lorenzo Corsini was born in Florence in 1652, the oldest son in an aristocratic family that had produced a cardinal of the Church in every generation for one hundred years. His earliest studies were in Florence followed by the Roman College. At the University of Pisa he received a law degree in 1675. Corsini renounced his inheritance after his father’s death in 1685 and with the help of his uncle, Cardinal Neri Corsini, he entered the curial service. He was thirty-three years of age. Living on the Piazza Novona, Corsini’s home was the center of Rome’s scholarly and artistic life. He was himself an accomplished violinist. In 1690, Alexander VIII named him titular archbishop of Nicomedia. He was ordained the following June. In 1691 he was made nuncio to Vienna but the emperor would not receive him since his own nominees were rejected. Because of this, Corsini remained in Rome as the treasurer of the apostolic chamber. This position gave him expertise in financial matters. In 1706, Clement XI made him cardinal priest. And in 1725, he was named bishop of Frascati. Cardinal Corsini was considered one of the papabili (that is, cardinals considered to be front-runners in elections) at several conclaves. 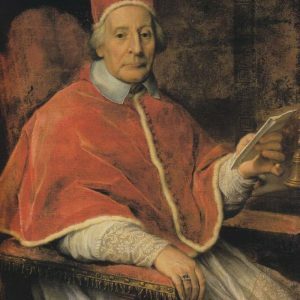 His predecessor, Pope Benedict XIII, died in 1730 at the age of eighty-one. 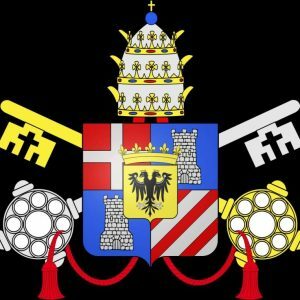 The conclave which followed is considered to be the longest and most corrupt of the 18th century. At some point in the four-month long ordeal, at least half of the cardinals had been proposed. In addition to the individual Catholic states’ candidates, the Florentine House of Medici was using financial enticements to forward their candidate, Lorenzo Corsini. 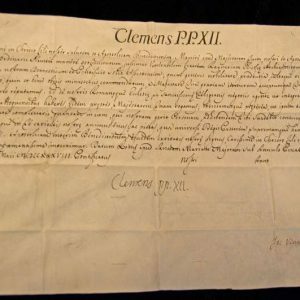 After months of contention, Corsini was chosen and took the name of his patron, Clement XI. He was seventy-eight years of age at the time of his election and would rule for nearly ten years. 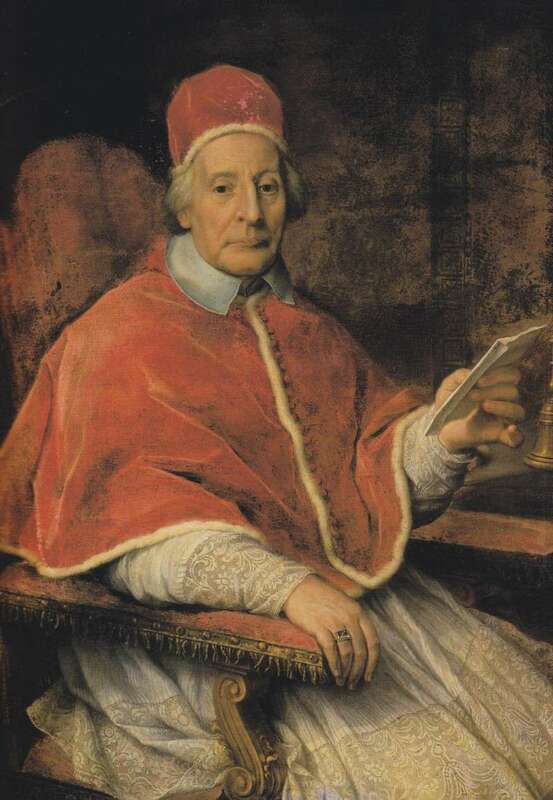 One of Clement XII’s first acts as pope was to bring to trial and imprisonment the corrupt Cardinal Coscia, the ‘right arm’ of his predecessor, Benedict XIII, who, together with his cronies, had enriched themselves by selling offices and accepting bribes. (Despite the huge fine and imprisonment, Coscia eventually was freed from prison and attended several more conclaves.) This act was followed by a monumental effort to overhaul the papal finances in disarray due to Coscia’s embezzlements. But the corruption was deeply entrenched in the administration and despite his best efforts, Clement XII was unable to untangle all of it or to settle his debts. Several things contributed to Clement’s inability to reduce the debt that continued to increase until the time of his death. Besides the corruption mentioned above, the reduction of revenue from Catholic powers in Europe, and the invasion of the Papal States made it impossible to correct all the damage done during the previous papacy. Among other means, to increase funds, he revived the lottery system, issued paper money, taxed imports and created a free port at Ancona. Clement XII was severely hampered by his advanced age and physical infirmities. Not only was he totally blind by the second year of his pontificate but also mostly bedridden from gout and a hernia as well. Despite his suffering the elderly pontiff conducted the business of his office from his bed. The Catholic Encyclopedia states that he displayed a wonderful level of activity. However, prestige in secular affairs was at its nadir. The emperor, Charles V, annexed papal fiefs and Clement was powerless to interfere. The Polish War of Succession was also outside his influence. He had no impact on the invasion of the Papal States by Spanish troops. He simply was unable to interfere, mediate, guide, control or even exercise the temporal power of the head of a state. This pope was chosen not so much as a spiritual leader but as a political leader. And yet, his decision regarding the Freemasons is central to his papacy. In 1738 he published In eminenti, the first papal condemnation of Freemasonry. In this bull he attacked its naturalistic bias, demand for secret oaths, anti-clericalism, indifferentism and the threat to church and state. 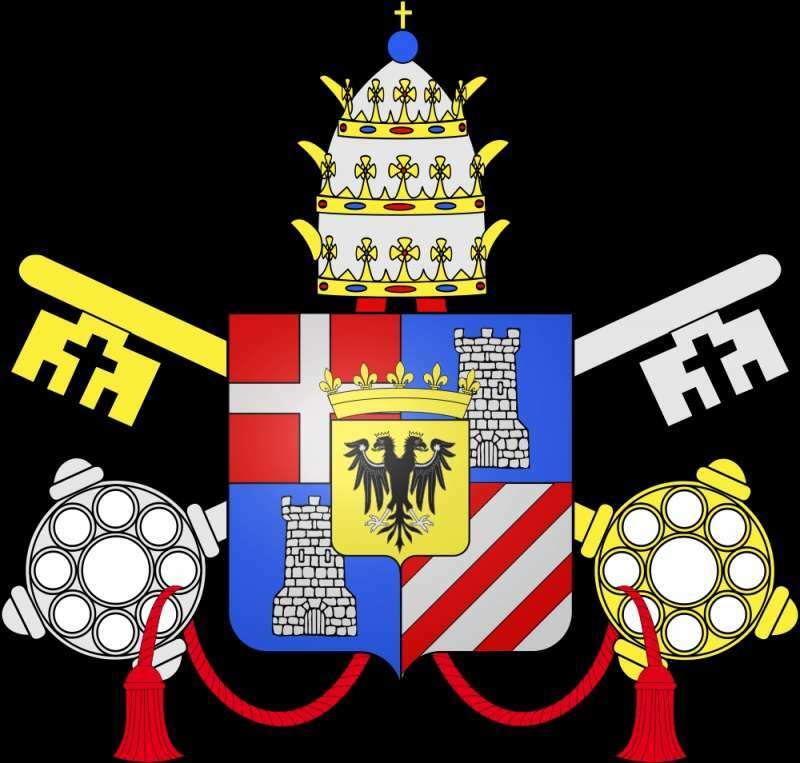 For some time he created only Italian cardinals because of the great hostility of the European rulers towards him. In 1731 and 1732, he restricted the rights of cardinals, particularly regarding financial matters during a vacancy. Clement was a keen supporter of the missions, particularly in the Far East. He renewed the prohibition on Chinese rites that had been established by Clement XI. He took great interest in such diverse missions as Ethiopia, Paraguay, Burma and Tibet. He founded a college in Rome for the Lebanese Maronites in 1732 and sent a legate to the synod of Mount Lebanon, which effected a complete change in Maronite liturgical and canonical life. He canonized Vincent de Paul, an ardent opponent of Jansensism. The wealth of his family and the proceeds of his lotteries helped Clement XII to embellish Rome. The most noteworthy of his accomplishments was the museum of antique sculptures, the first in all of Europe, and the principle façade of St. John Lateran, as well as a chapel within. The Piazza de Trevi and its magnificent fountain are also to Clement’s credit, although they were unfinished at the time of his death. He enlarged the Vatican library with valuable collections, medals and vases. Clement XII’s reign is remarkable in the face of his physical disabilities and its illustration of the papacy’s ineffectiveness as a secular power amidst the absolutist power of the European countries. Clement XII died in 1740 from complications of gout. 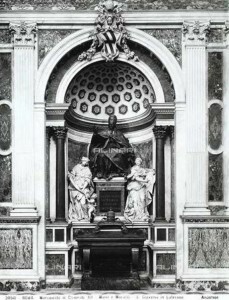 His tomb in the Basilica of St. John Lateran is located in the Corsini Family’s chapel. 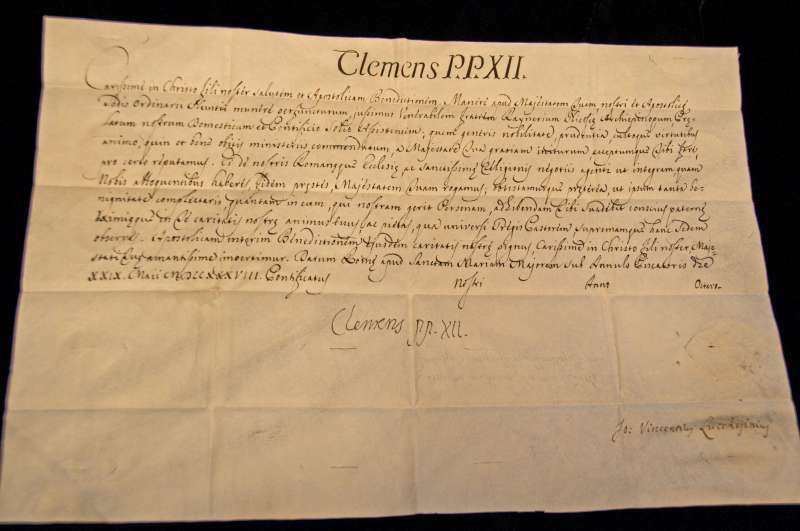 An Autograph of Clement XII Signed as Pope.